We checked and in Europe they haven’t even released season 2 yet so it will take a while for Season 3. We added the screencaptures of The Expanse 3×11 into the gallery. The space-faring political drama tightened the screws and ratcheted up the tension in its third installment, which collapses a full novel and a half from the book series it’s based on into a single season of television. Complete with memorable guest arcs from David Strathairn and Elizabeth Mitchell, the series finally dug into the true nature of the mysterious alien presence in our solar system. Anna Volovodov, the minister with a heart of gold and will of steel. 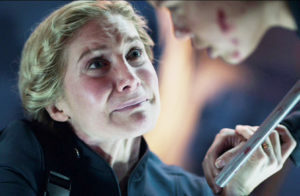 Elizabeth Mitchell pulls off heartfelt righteousness without sinking into buzzkill, virtue-signaling annoyance, but those Lost fans already know what I’m talking about.